The share of people who drove alone to and from work in Denver fell slightly in 2017, according to new estimates from the United States Census Bureau’s American Community Survey, while the percentage of people who walked, biked, and rode transit barely budged. Solo driving fell by almost two percentage points, to 67.9 percent, compared to 2016. Denver hasn’t seen a figure lower than that since the 2008 recession. If the pace somehow continues, Denver would meet the Hancock administration’s 2030 goal of cutting single occupancy vehicle commutes to 50 percent. Transit, walking, and biking did not enjoy such a positive shift, however. The share of transit riders grew .4 percentage points in 2017, but that figure falls within the survey’s margin of error. Same with the .1 percent decrease in walking. The share of people bike commuting held steady at 2.2 percent. 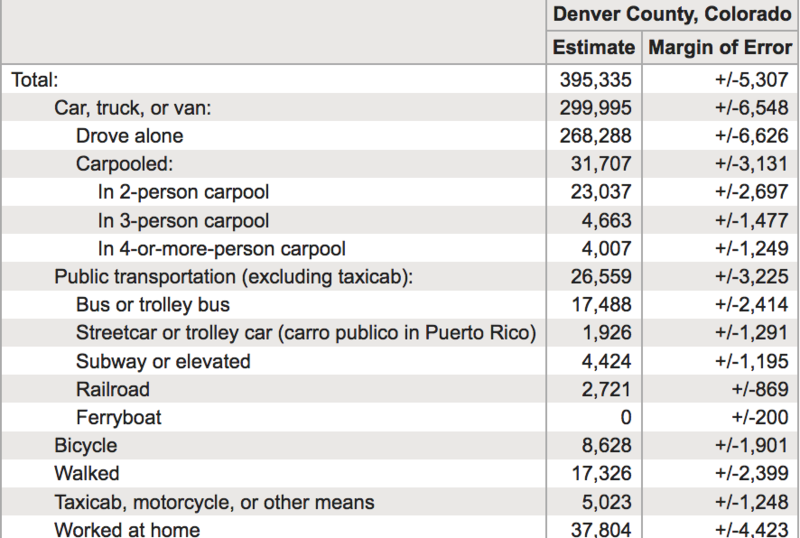 Of course, Denver gained nearly 10,000 people during that period, meaning the raw number of people biking and riding the bus and train to work likely grew. I can’t figure out how to shame Hancock with this information. We need more effort ($) put into making non-driving options preferable. That raw numbers chart showing the ‘margin of error’ is rather useless w/o prior year numbers. More interesting is that APTA finally published 1st quarter transit results. For Denver bus ridership continued its bad trend, down just over 6%. Light and commuter rail however were up nicely with light rail up a bit over 9% and commuter rail up 15.83%. Light and commuter rail ridership is now just over half as much as buses. Nice graph! – I would love to see more years included to show the peak cycling percentage in 2012 at 2.9%. – Interestingly, even with the commuter population growth, we still haven’t reached the same number of Bicycle commuters as the peak in 2012 (9,540 in 2012 vs. 8,697 in 2017). So, what’s not working? – Weigh in community! A bit late, but the decrease in single car usage is almost certainly because of the increase of people working from home. That’s probably an obvious statement, but I feel I needed to point out that the importance of transit has not come up yet. I notice that RideShare, which is worse than driving alone, is not included. Based on the % of Lyft/Uber cars downtown and adjacent neighborhoods, it’s significant. And sorry but the ‘taxicab’ category isn’t going to capture that.